* On average, the southern end of the fault generates an earthquake every 240 years. * The last quake that ripped the entire 800 miles of the fault happened 311 years ago. 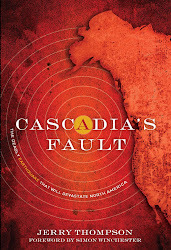 * Cascadia’s Fault is virtually identical to the one in Sumatra that killed 230,000 people. * When Cascadia rips apart from end-to-end, the quake will be magnitude 9 or higher. * A magnitude 9 on Cascadia will be like five Hurricane Katrina’s on the same day. * A tsunami generated by Cascadia’s quake could reach 30 to 100 feet in height. * Cascadia’s waves will cross the Pacific causing damage as far away as Asia and Australia.